One word of warning: wait for your pears to ripen before you bake them. They will be so much better. And this recipe is not the place to jettison your overripe pears, either; when your pears are past their prime, make this instead. 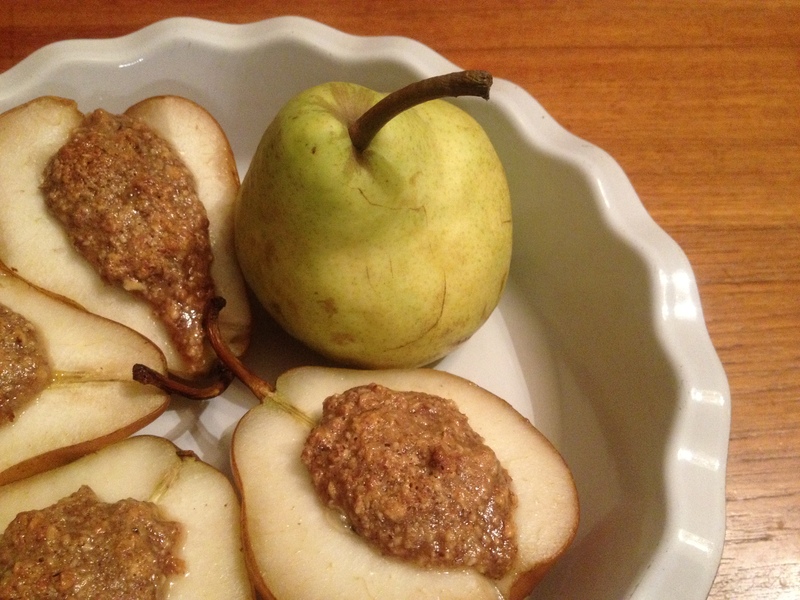 Hazelnut Baked Pears: In a food processor, grind 3/4 c. toasted hazelnuts with 5 Tb. brown sugar or maple syrup and 1/8 tsp. salt until gritty. Add 1 1/2 Tb. soft butter and 1 1/2 Tb. hazelnut oil and pulse until a sticky mixture forms. Scoop into four halved and cored pears, and bake them in a dish with a splash of Frangelico or sweet wine or water at 350 for about 25 minutes, until the fruit is nice and soft. If there is liquid in the bottom of the pan, spoon it over the pears as you serve them. Yum! I love hazelnuts and never have enough ways to use them! What a wonderful combination! And you are right – a perfectly ripe pear is a beautiful thing. Much the same way I feel about a perfectly ripe nectarine. Mmm, or a peach…I can’t wait for summer fruit! I have been looking for hazelnuts at 7, that’s right SEVEN stores over the last week. Must be a hazelnut shortage around here. Seriously jealous! Those look beautiful! That’s crazy! I hope you come across some soon–or decide to settle for another nut. :) I love walnuts, almonds, cashews, so many! This looks so unusual to me, and I’m totally intrigued. They’re going on my ‘must try’ list! Looks wonderful! Madison’s recipes are always so versatile. Agree that I’m a chocolate girl when push comes to shove, but fruit runs a darn close second. And hazelnut anything always captures my attention. This may be more than once a year for me :) Thank you for posting! MMMMMMMM! Hazelnuts are heavenly, even more so when baked… but when combined with pears — I can only imagine! This looks fantastic. I don’t often bake with hazelnuts, but I should! They get so toasty and crunchy. I feel like I might need to test out some hazelnut biscotti recipes soon! I have a great hazelnut poundcake recipe if you’re ever interested! And hazelnut biscotti is the best! I haven’t posted it yet — but you have officially motivated me to do so! I’ll send you a link when I do. Yum! Is hazelnut oil hard to come by?! Where did you find yours? WOW, these as dessert, with a glass of Frangelico, mmmmmmm, yes please! That is SUCH a good idea, I don’t know why it never occured to me to stuff pears. I’ve baked them before though, though I must say I really do think a pear that’s perfectly ripe is really almost too perfect to mess with, sweet juicy and succulent mmmm. It looks beautiful–and delicious! Pears and hazelnuts are such a magical combination.